With Christmas less than two weeks away, you may be feeling the crunch to get the perfect gift in time. Or perhaps, your gift budget is running low, yet you still have quite a few people on your list to give gifts to. Here are easy last minute solutions to earn free or cheap gifts for the season. Many people have mentioned the fun and ease of Swagbucks. Have you signed up already? Are you participating every day to get bucks? Spending just a few minutes each day searching, doing the daily poll, and other small and fast tasks will add up quickly. You will easily receive more points for every person that signs up under you. Once you have someone sign up under you, every time they earn a Swagbuck, you earn one too. For easy earning, sign yourself up and then have your spouse or family member sign up under you. My husband and I spend minimal time on Swagbucks and earn at least a $5 Amazon gift card each month. I know you may be thinking, “What can $5 buy me on Amazon?” With no taxes (in most states) and a prime membership, $5 can choose from a lot of small and affordable gifts for kids and friends. Also, the Amazon gift card available on Swagbucks can be combined in your Amazon account to add up to a greater amount. While Coinstar does not exactly reward you with free cash, it can turn your huge coin collection into real hard gift cards. When you cash in your coins to Coinstar and redeem them for gift cards, including the Amazon e-gift certificate, you do not have to pay any extra fees that are usually associated with cashing in coins for cash. Coinstar recently added gift cards for Chili’s Grill & Bar, Maggiano’s Little Italy, Papa John’s, and Toys”R”Us. You may be surprised by how many coins you have. Even cashing in enough to earn a $5 gift card puts you $5 ahead in your spending budget. Make homemade caramel sauce and pair it with homemade hot chocolate mix. 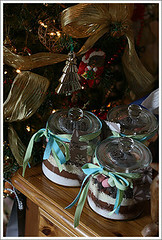 Place them in small glass jars with a cute note saying, “Have a sweet Christmas”. Pair a small bag of gummy worms with a notebook full of quotes from books, a pen, and perhaps a book (check the local thrift store for great deals). Attach a note saying, “To my favorite book worm”. A bag of popcorn with a handmade ticket that says, “Admission to One Free Movie Date with me” (Of course, this may cost more than $5 when they do wish to see the movie, depending on what time you go). Cover a wooden letter (check your local craft store) with yarn for a home decor gift great for the whole family. Fill a tea cup with several bags of tea and pair with a side of homemade scones or tea cakes. Bake bread from scratch and pair with homemade or store bought jelly. Homemade play dough for children. A big tin of homemade cookies or brownies. Just because your Christmas budget may be tight this year, there is no reason to stress out over gift giving. Most people are appreciated at the thought behind the gift. Always pair the gift with a special card or note to really show the gift receiver how much you appreciate and care for them.